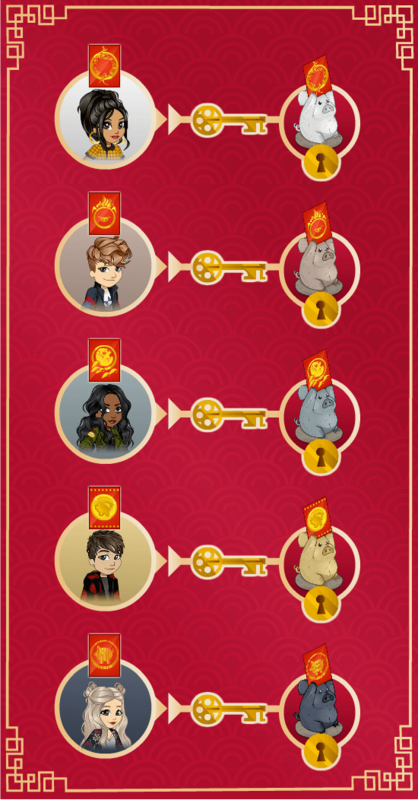 We're bringing a Chinese New Year tradition right into Woozworld with Friendelopes! Friendelopes are special envelopes held by pig statues. Once a day, starting today (Jan. 24) at 7PM WT until Feb. 6 at 6:59PM WT, you will receive a Friendelope and a special power, which will show above your head (kind of like a SymbZ.) Each Friendelope pig statue will represent one of the elements; wood, water, earth, metal or fire. To open your Friendelope, you'll need to find a Woozen whose special power matches your Friendelope pig statue! You will also need to use your special power to open someone else's Friendelope. So, not only will you be getting free gifts, but you might make some new friends, too! Once you've used your power, it will disappear from above your head. You will receive a new power and Friendelope when you connect to Woozworld after 7PM WT. What's in your Friendelope, you ask? Some days it will be special Year of the Pig clothing (which will be sold on Feb. 4 for 24 hours) and some will be Wooz. If you use your special power to unlock Friendelopes on all 13 days, you have a chance of getting an Earth Pig Block UnikZ! Find out on Feb. 7 if you are one of the lucky few who get one! Published on 2019-01-23 05:00 AM WT.